City Council today proved that it is ready for reform – just not very much reform. It was a tense debate over which reform to support: one that would give Inspector General Joe Ferguson broad, sweeping powers to investigate and audit aldermen, or a more hands-off approach favored by powerful Alderman Ed Burke (14th Ward). The outcome was in doubt until the very end. By the narrowest of margins, City Council voted 25 to 23 in favor of the revised ethics ordinance, the one championed by Burke. Some aldermen made a football analogy, comparing the revision to driving down the length of the football field and kicking a field goal instead of scoring a touchdown. The ordinance will give Ferguson the power to investigate misconduct allegations against aldermen, but it stops there. It does not give Ferguson that ability to audit committees and programs that aldermen run. We’re told by several aldermen that Burke lobbied furiously behind the scenes, offering favors to aldermen who would vote for this revised ordinance. Burke chairs the City Council Finance Committee, which runs the $100 million city workers’ compensation program, something he has fought to keep away from Ferguson’s oversight in the past. In the end, he was able to persuade enough aldermen that this ordinance that will still shield that program from oversight is reform enough. “The people who want the un-amended ordinance are writing a blank check,” said Ald. Will Burns (4th Ward), who spearheaded the effort to revise the ordinance in a working group that convened after last month’s City Council meeting. Burns is resigning his post in March to take a job with Airbnb. Mayor Rahm Emanuel has refused to pick sides in the fight, repeatedly insisting that whatever they chose, aldermen would not revert back to the days of nobody watching over them. Other aldermen favored the original version of the ordinance, the one that would have gone all the way and allowed Ferguson to audit aldermanic programs like workers’ compensation. They say some unseemly behind-the-scenes activity prevented that from happening. “I just think we had an opportunity to not water this down, to show constituents we were going to have full transparency and oversight in everything this council does, and we came up short,” said Ald. John Arena (45th Ward). Arena did not let the partial loss stop the discussion on whether or not Burke’s workers; compensation program should receive greater oversight. He introduced a resolution that would call for debate on whether to take it out of Burke’s hands and transfer it to the executive branch. 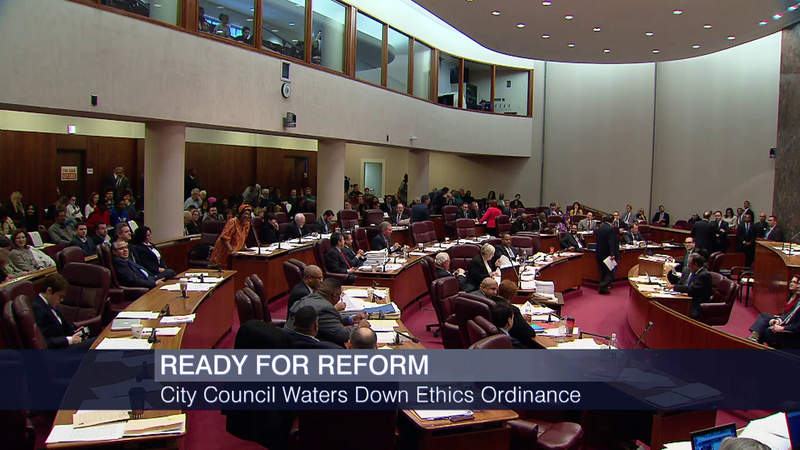 See how each alderman voted on the revised ethics ordinance. As aldermen debate who should be allowed to investigate them, former City Council watchdog Faisal Khan talks about his time at City Hall and why he billed the city for a flat-screen TV. Jan. 13: Just when you thought City Council might actually be ready for reform, two powerful aldermen put the brakes on. An effort to give city Inspector General Joe Ferguson the power to investigate aldermen was delayed even after a majority of City Council members said that they support the effort. Jan. 11: As Chicago aldermen push for new oversight of City Council and take a hard look at proposals to borrow billions, they’re also faced with ongoing ethics questions about the city’s Law Department and police review authority. A panel of aldermen joins "Chicago Tonight" to discuss those issues. Jan. 11: Who is going to make sure Chicago aldermen play by the rules? A major step forward today in determining the answer to that – a sign that City Council could finally be ready for real reform. Nov. 16, 2015: Now that controversial Legislative Inspector General Faisal Khan is out, what will aldermen do with the watchdog office? We speak to three aldermen about whether the future should be in the hands of Chicago's Inspector General Joe Ferguson. Nov. 13, 2015: A report from the City Council Office of the Legislative Inspector General concludes that 29 aldermen took in a total of $282,000 in illegal campaign donations in 2013.